2010 was a great year for Science. NASA's space plane (and the Dolly lineage) were resurrected while a secret laboratory Neturino observatory was built under the South Pole. 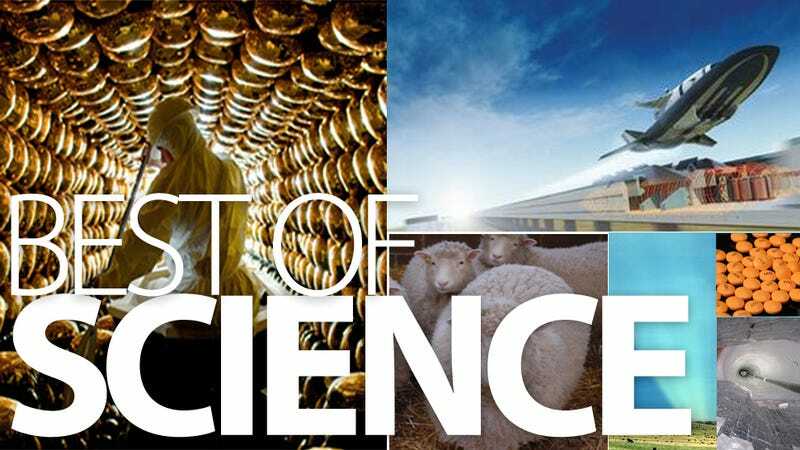 Check out our best science stories of the year! NASA has been working on creating a new, cheaper method to launch spacecrafts. Their latest proposal involves train tracks, a rail gun and a scramjet. Here's what they're trying to do. Sorry to ruin your enjoyment of Mission to Mars-or, fine, Aliens and Star Wars-but it joins a host of sci-fi movies that just can't quite get their space science right. Here are the most common offenses and offenders. 6. Dolly the Sheep Is Alive, Alive, Alive, Alive! In 1996, Dolly the sheep made headlines for being the first mammal cloned from an adult cell. She was put down in 2002. But as it turns out, Dolly's still alive today. A scientist secretly made four copies years ago. It looks like a scene from some sci-fi epic. But for a week in October, anyone visiting the Manchester Science Festival was able to don a white tyvek suit and paddle through this wormhole of spectacular golden balloons. For science! The metal balls in this image are only 2 millimeters in diameter (0.078 inches). The image, which covers an area about 0.5-inch long and is illuminated by four white light-emitting diodes, was taken by NASA's latest and most advanced camera. Humans can't walk in straight lines. If there's no fixed point of reference, we just walk in circles and inevitably get lost. Nobody knows why, but researchers at the Max Planck Institute for Biological Cybernetics have confirmed it in several experiments. 10. What Are Anticrepuscular Rays? Perhaps you have seen something similar to this one day, probably when you thought you were hearing a choir of angels and the Apocalypse was about to break loose. They are anticrespuscular rays, and they happen opposite to the Sun.